This course will teach you the skills in make-up application to give you that professional edge. Photographers, beauticians, hairdressers and ladies returning to the workforce who want to update their skills or learn new ones to incorporate into their business or personal routine. Only Serena teaches, there are no substitutes. All makeup, brushes and tools and reference charts are supplied. Students will need to supply their own models for some of the lessons and may bring a camera to record their work at the various stages. No previous experience is necessary, only the desire to learn is required. Students will learn sufficient information and skills ( practical and theory) to begin a career as a make-up artist. A maximum of four students per course ensures individual attention is given. A certificate is awarded on completion of the course and practical assessment. Students will be offered the opportunity to participate in a professional photographic shoot for themselves and/ or with models at the completion of the course to enable them to start a portfolio and appear on Serena’s Image website for sourcing work. Serena's Image reserves the right to publish videos or photographs taken during class on their Instagram & Facebook pages (for promotional use only). No names will be used unless by arrangement. If you do not wish to have any images published, please advise at the time of enrolment. Master the art of Professional Makeup Artistry under the guidance of top professional makeup artist, Serena Keenan at Serena’s Image Training Academy - Choose to study the 9 weeks part-time course. Learn how to make-up like the stars! Whether you just want to learn better skills for your personal look or start a new career. 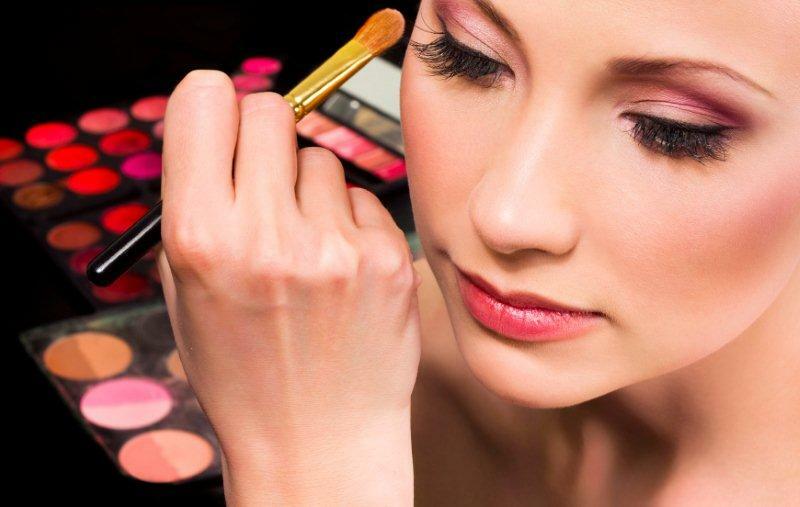 The course will teach you the skills in makeup application to give you that professional edge. Many of Serena’s students are photographers, beauticians, hairdressers and ladies returning to the workforce who want to update their skills or learn new ones to incorporate into their business or personal routine. Great for beginners from age 16 (no prerequisite of prior learning). How many people are usually in the course? What is the difference between makeup for fashion / catwalk & bridal? There are two different types of work possible in beauty makeup. In the fashion industry, Makeup Artists prepare models for photography, TV commercials, magazines and catalogues, gala fashion events and fashion parades. In the wedding makeup industry, the Makeup Artist prepares the bride and wedding party with a superior wedding makeup for the ceremony. The wedding industry is consistently busy and offers good remuneration for Makeup Artists. Most Makeup Artists work in both fashion and weddings. Both require the same knowledge and practice of beauty and makeup. Makeup courses are conducted over a short time frame. They are more intensive than others. This enables students to quickly gain the qualifications and experience they need to practice beauty / fashion or wedding makeup. We offer only Design and Application Make-up and this is why our courses are shorter as they are mainly technique based. During the course, Serena notes individual strengths and corrects weaknesses; so that every student completes the course with total competence in every aspect of beauty makeup. Serena trains, using the top quality makeup products from Jane Iredale & Motives ( the equivalent of Mac, Bobby Brown & Chanel). Serena’s Image Makeup Training Academy conveniently runs its courses both day and night and intensive programs in regional areas. The trainer, Serena Keenan, is a working Celebrity Makeup Artist with over 40 years experience and with a large client base of models, celebrities, photographers, television stations, magazine clients. Serena knows exactly what the current styles and latest techniques are and when she is not making faces is running a successful Training Academy & Model Management business, Serena also represents makeup artists to assist them in gaining work. Serena has over 30 years of experience in running her own business and major events. She can provide a lot of advice to students about developing their own business. Serena Image Training Academy offers one of the best value-for-money makeup courses in Australia. What is the cost of the Makeup Artistry Course? A manual, face charts, tuition, makeup kit, case & brushes, trade secrets and application techniques and a certificate on completion of assessment. An optional photo shoot is available at the conclusion of the course at an extra cost. There is a practical assessment on the completion of the course. A deposit of $1347 is payable when you apply and is deducted from the full amount when the balance is paid. There is also a pay-as-you-learn facility for our weekly courses ($1347 deposit with enrolment, + 9 weekly payments of $150 totaling $2697). If a student can not attend the course they can defer to a later date provided notice is given at least two weeks prior to commencement. Course must be taken within 12 months of original start date. If you refer a friend that enrols and starts in the same course, you will receive a $100.00 voucher redeemable on products from our makeup ranges. How do I secure a place in the course? Complete the enrolment form and email with your preferred payment option. Enrolments will not be confirmed without a deposit or full payment. Night classes are available on Mondays (Sunshine Coast only-1 lessons per week X 9 weeks from 6-9pm ). You may be required to bring a model/friend to some of the lessons starting from week 3 or students will work on each other. A professional Jane Iredale Makeup Kit and case is included. Professional Brush Set, Pencil Sharpener, and Eye Makeup Remover, makeup remover wipes, makeup cape, headband, hand towel, colour wheel & consumables. You will need to replace consumables when they run out. It is advisable to bring a camera or camera/phone to take photos of all your work as you progress. An essential part of a Makeup Artist is good grooming & personal care. Please ensure you have Breath freshener or mints, hand sanitiser in travel size and no body odour. Kit value $1947.00 --- included in your course - WOW! $100.00 voucher, redeemable on makeup products from our range is offered if you refer a friend who enrols in the same course. The Serena’s Image Certificate in Makeup Artistry is a unique and practical course based on personal experience and training spanning over 40 years and using top quality professional products. This is not an accredited course, nor a nationally recognised qualification however it is recognised by professionals in the Beauty, Retail, Modelling, Photographic, Television and Entertainment industries.